In the world of cocktails, a great deal of faith is placed in precedent and tradition. We look to the written works of bartenders from a century ago for inspiration, who were themselves inspired by the Punch-makers from a century before, who were, in turn, increasing the potability of spirits that had been in production for a century before that, if not longer. In our own time, we are reasonably certain of the origin of the cocktail, of Punch, and of the Western lineage of mixed drinks. As with all historical accounts, however, there remain certain isolated pockets of knowledge — tidbits that have been overlooked in the general histories. While these tidbits may seem trivial to the population at large, they remain a central focus in their native cultures. All of this verbose generalization is leading me to theme of our most recent Mixology Monday — The Unknown — hosted by Chris at A Bar Above. Chris has asked us cocktailians to explore ingredients that have remained untasted and techniques that have never been utilized, to explore the undiscovered country of cocktails in the hopes of making new advancements. So, what is poitín? Well, if you want to keep things brief (and sell the spirit a bit short), you can call it Irish moonshine, but it is more often regarded as the precursor or progenitor of all Irish whiskies. It is typically a rustic, countrified spirit distilled from malted barely, though the mash frequently includes other grains, sugar beets, and potatoes. Most poitíns seem to remain relatively young — they are either unaged or briefly aged — and therefore resemble “white dog” whiskies in terms of flavor profile, i.e. fruity and heavy on the taste of raw or fresh grain, not having time to develop the complex flavor compounds found in most barrel-aged whiskies. Stir with ice and strain into a chilled coupe. No garnish necessary, though and orange twist may not be out of place. Compared to unaged or clear poitín, the nose moves in the direction of more “typical” Irish whiskey — heavier on the caramel, malt, and char, but retaining quite a bit of grass, fruit, and berries. The spirit is thick on the tongue, and buttery; there are flavorful hints of straw, cane, or reeds. Also, there are beer-like notes on the nose and on the tongue, reminiscent of sour Belgian beers; these notes are merged with a slight sweetness and hints of green grapes, cured dates, black currants, and muscadines. So, a woody, grassy, grapey, young whiskey made from barley. For a cocktail involving this spirit, I stuck with the tried-and-true Golden Ratio formula pioneered by Jamie Boudreau. I chose the Cocchi vermouth for its robustness and heavy dose of cinnamon — I figured the spice would combine well with the grape- and date-like flavors of the poitín. The poitín is a fairly light spirit, however, so I reduced the amount of fortified wine. 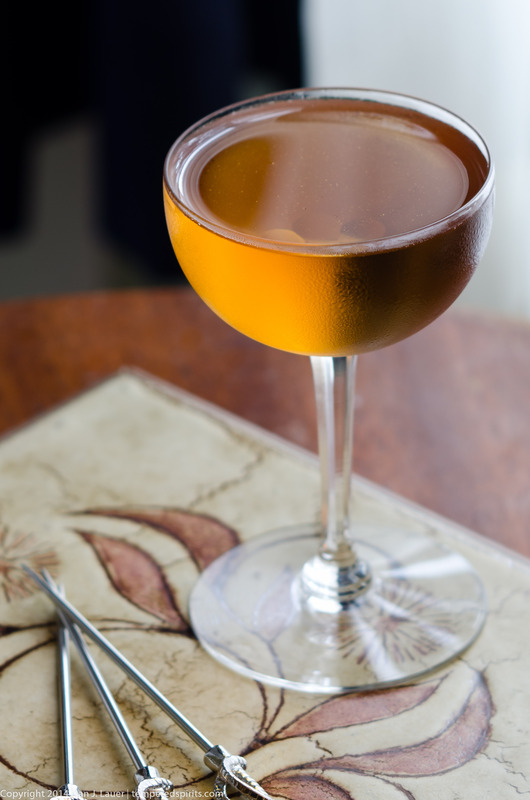 When combined with the poitín, the vermouth brings out a light, gentian-like bitterness, similar to that found in liqueurs like Suze (but not nearly as intense). The Licor 43 is there as a kind of binder — its vanilla-heavy sweetness helps round out the drink and improve the mouthfeel. I find that grassy or woody spirits like poitín benefit from a small dose of thick, sugary additive. Finally, the orange bitters add just a touch of zip or zing to the drink; orange oils from a peel might achieve the same effect. Also, a couple drops of salt tincture or salt water may not be out of place, as they would help counteract any slight bitterness or excessive sweetness. Overall, the Maturin is really a Manhattan variation. While not as robust and heavy-hitting as some other takes on the classic formula, it retains a lightweight sophistication and complexity while making use of a relatively obscure (and, I thought, somewhat tricky) spirit. Should you decide to seek out the elusive poitín, I’ve been told it’s making inroads here in the Northeastern U.S., especially in Boston and New York City; if you live elsewhere, mail order or a visit to Ireland may be your best bet. Give it a shot, should you encounter this oddball spirit in your local watering hole. PS: Ah yes — the name. The drink is a liquid tribute to Stephen Maturin, the surgeon-naturalist-intelligence agent who plays companion to Captain Jack Aubrey in Patrick O’Brian’s Aubrey-Maturin series. Maturin is the son of an Irish soldier and a Catalan lady — I thought the merger of traditional irish spirit with casks of Spanish sherry and Spanish liqueur made a fitting tribute to a legendary character. Maturin also plays the ‘cello, and he and Aubrey share a penchant for Boccherini (an Italian composer living in exile in Spain, no less), which covers the use of Italian vermouth in the drink. 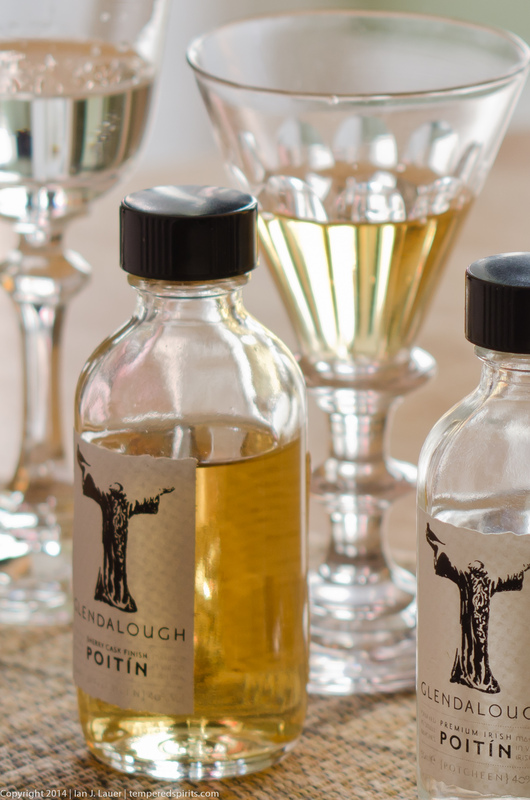 PPS: As I mentioned early in the above post, a follow-up review of Glendalough’s range of poitín is forthcoming. This entry was posted on September 21, 2014 by IJ Lauer in Drink Recipe, Licor 43, Orange Bitters, Original Drinks, Poitin, Spirit Information, Spirit Tasting, Sweet Vermouth and tagged cocktail, glendalough, maturin, mixology monday, orange bitters, poitin, recipe, sweet vermouth.